The following article written by H.E. 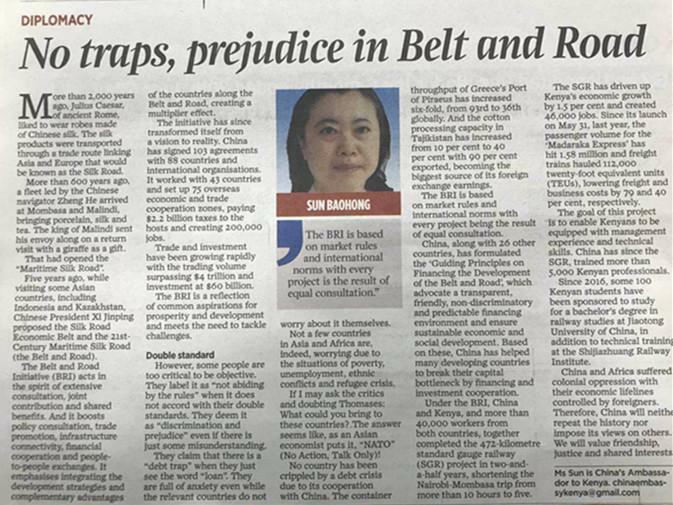 Ms. Sun Baohong, Chinese Ambassador to Kenya, was published on the Daily Nation newspaper of Kenya on 2nd August, 2018. More than 2000 years ago, Julius Caesar of ancient Rome liked to wear the robes made of Chinese silk. The silk products were transported from China through an ancient trade route that linked Asia and Europe. It was later known as the Silk Road. More than 600 years ago, a fleet led by the Chinese navigator Zheng He arrived at Mombasa and Malindi, bringing porcelain, silk and tea to Africa. The king of Malindi sent his envoy along with the fleet to pay a return visit and took one giraffe as gift to China. The envoys from China and Kenya, together with the merchants from other countries in Asia, Africa and Europe have opened the "Maritime Silk Road". Kenya has been an important bond linking China and Africa since ancient times. Five years ago, when visiting some Asian countries including Indonesia and Kazakhstan, Chinese President Xi Jinping proposed the initiative of building the Silk Road Economic Belt and the 21st-Century Maritime Silk Road( the Belt and Road). This is not only the inheritance and innovation of the spirit of the ancient Silk Road, but also the desire for mutually beneficial cooperation, prosperity and development shared by all countries. The Belt and Road Initiative acts in the spirit of extensive consultation, joint contribution and shared benefits. And it boosts policy consultation, trade promotion, infrastructure connectivity, financial cooperation and people-to-people exchanges. It emphasizes on integrating the development strategies and complementary advantages of the countries along the Belt and Road, thus creating multiplier effect. The past five years have witnessed that the Belt and Road Initiative transformed itself from a vision to practical actions with fruitful cooperative results. By now, China has signed 103 agreements with 88 countries and international organizations. China worked with 43 countries and set up 75 overseas economic and trade cooperation zones, paying 2.2 billion USD taxes to the host countries and creating 200 thousand jobs locally. The trade and investment between China and the countries along the Belt and Road have been growing rapidly with the total trading volume surpassing 4 trillion USD, and the investment volume totaling more than 60 billion USD. All these facts have proved that the Belt and Road Initiative originates from China but belongs to the world. The Belt and Road Initiative is a reflection of many countries' common aspiration for achieving prosperity and development. It also meets the need of the countries to tackle their own challenges. That is why it has exerted huge impact on the world and attracted extensive attention. However, some people are too critical to be objective. They label it as "not abiding by the rules" when it does not accord with their double standard. They deem it as "discrimination and prejudice"even if there is just some misunderstanding. And they claim that there is a "debt trap" when they just see the word"loan". They are full of anxiety even while the relevant countries do not worry too much about themselves. Not a few countries in Asia and Africa are indeed worrying due to the situations of poverty, unemployment, ethnic conflicts and refugee crisis. What do they need most?I believe they need development more than anything else. May I ask those who are full of anxiety and doubts: What could you bring to these countries and how could you help them out? The answer seems like as what an Asian economist puts it: "NATO" (No Action, Talk Only)! No country has been crippled with debt crisis due to its cooperation with China. Instead, the container throughput of Greek's Piraeus port has increased by 6 times, jumping from 93rd to 36th globally. And the cotton processing capacity in Tajikistan has increased from 10% of its cotton output to 40%, among which 90% has been sold abroad. It has become the biggest source of Tajikistan's foreign exchanges earnings. There are too many examples to mention. The joint efforts made by China and countries involved to push forward the Belt and Road Initiative are based on market rules and international norms. Every project is the result of equal consultation. China, along with other 26 countries has jointly formulated the Guiding Principles on Financing the Development of the Belt and Road. The Guiding Principles advocate a transparent, friendly, non-discriminatory and predictable financing environment and ensure sustainable economic and social development. Debt sustainability is also taken into account when mobilizing finance. Based on these principles, China has helped many developing countries break their capital bottleneck by financing and investment cooperation. Our partner-countries and their people are best qualified to evaluate the cooperative effects. Let's return to Kenya. Under the framework of the Belt and Road Initiative, the governments of China and Kenya, and more than 40 thousand workers from both countries, have worked together to complete the project of 472km SGR within two and half years, shortening the Nairobi-Mombasa trip from more than 10 hours to 5 hours. The building of the SGR has driven the Kenya's economic growth by 1.5 % and created 46 thousand jobs for local residents. Since it was launched on May 31st last year, the Madaraka Express passenger volume has reached 1.58million and its freight trains have hauled 112 thousand TEUs, which has lowered down the freight cost by 79% and business cost by 40%. "Teach a man to fish and you will help him for a lifetime". The SGR project has been upholding this concept from the very beginning. The eventual goal of this project is to help the Kenyan people to be equipped with management experience and technical skills. Since the construction of the SGR, the Chinese side has trained over 5,000 professionals for Kenya. The 27-year-old Felix Asuma, once studying at Southwest Jiaotong University of China, has become the mid-level manager who supervises 80 staff. He said that he studied civil engineering in China and the SGR is where he could maximize his potentials. The SGR has brought positive changes not only to his life and career, but also to Kenya's economic development as a whole. Kennedy Chemeitoi is a native Kenyan who began to work for the SGR since 2017. Now he takes care of the power system. He said, "What I learned from books is not the same as the real. I learned a lot from practice. We have to pass test every month. This is to check whether we have managed the knowledge or not." Promoting overseas studies and training professionals are significant parts of the Educational Action of Belt and Road Initiative. Since 2016, 100 Kenyan students have been sponsored to go to Jiaotong University of China for their bachelor degree study in railway specialities. Moreover, Shijiazhuang Railway Institute has been working closely with some African countries including Kenya to train railway technicians. Many of the graduates have become the envoys of friendship and technological backbones of the Belt and Road in their own countries. Both China and African countries suffered from colonial oppression in history with their economic lifeline being controlled by foreign countries. Therefore, China will neither repeat the history of colonialism nor impose views on others. Instead, China will always respect and help Africa. We will value both friendship and justice as well as shared interests, and always place more importance on friendship and justice. I hope that the people who want to learn more about the Belt and Road Initiative and those who want to take the Belt and Road "train" could ask for the opinions of Felix Asuma, Kennedy Chemeitoi and their colleagues. They will tell you, "Welcome on board. There are no traps and prejudice on this train. "